471 to Newport, take the Fairview Exit, go West on Fairview to the Levee, Left on Washington, property is 3 blocks ahead on the Left between 34d and 4th streets. Condo is on Second Floor. 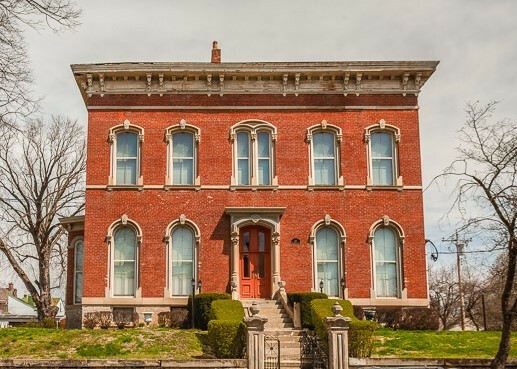 Feel like you live in Paris in this elegant 2nd floor condo in the Historic Saunders Mansion building! Sweeping stairways with hand carved handrails, 9 foot doors and soaring 13ft ceilings.Light pours in through windows 9ft tall!Living room is graced with an non-operating fireplace featuring original mantel and fireplace surround, and a fabulous chandelier hangs high above. Kitchen is updated with stainless steel appliances and counter tops. Glass doors on the cabinets open the space. Large pantry/storage closet and Laundry closet off the kitchen. Only 3 blocks from the Levee!! This listing courtesy of, Kemba Realty, Inc.